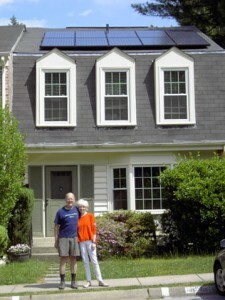 Jim and Sue Russ stand outside their Montgomery County home, which has received an energy efficiency upgrade and had a solar PV array installed. In the world of sustainable living, some just talk the talk. Montgomery County resident Jim Russ has been walking the walk for about 70 years. Growing up in Massachusetts, Russ was taught at a young age to enjoy nature and leave no trace. For him, this built an appreciation and respect for the planet. In addition to his reverence, Russ understands that the economics associated with a “green” lifestyle also work in his favor. 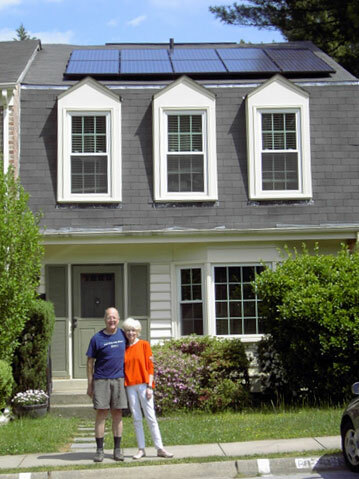 Russ and his wife Sue made their first move toward sustainability by investing in an energy efficiency upgrade, taking advantage of the Home Performance Rebate Program offered by the Maryland Energy Administration (MEA). Working with Standard Energy Solutions, Jim and Sue received an energy audit that identified low-cost solutions to improve the comfort and safety of their home and lower their energy bill. The grant helped fund the installation of insulation, the sealing of air leaks, and the installation of new carbon monoxide detectors. For Russ, the next step was to start generating clean, renewable energy. He contacted Standard Solar about installing a 2.3 kW array on his roof, and began to submit the necessary documents to his homeowners association. Unfamiliar with solar photovoltaic (PV) technology, the homeowner association was concerned about the work. Instead of giving up, Russ viewed this challenge as an opportunity. After he informed the association of the project’s benefits, “[The homeowner association] went from adversary to advocate,” Russ said. In fact, when a tree that would shade the panels was identified, the association removed it at no cost to Russ. Once the panels were online, Russ really started to see the impact. During the winter, his bills went from more than $208 to $134 per month, And during the summer, his bills went from $100 to $19 per month. While the savings alone are substantial, grants provided by MEA (in conjunction with other available tax incentives) helped make the investment an easy decision. In all, the couple received two grants from MEA for a total of $1,813, approximately two-thirds of which came from the Residential Clean Energy Grant Program. This program provides grants to Maryland residents who install solar photovoltaic, solar water heating, geothermal heating and cooling, and wind turbine systems on their residential property. Since 2010 to May 2012, MEA has helped more than 7,500 Maryland families install renewable energy systems on their homes. This includes approximately 3,700 solar PV systems, for a combined capacity of nearly 36 MW. While the prospect of travel is nice, in the end it all comes back to Jim’s lifelong dedication to the environment and sustainable living. “If you combine the economics with the environmental and moral benefits,” he says, “it is an easy decision.” With all his successful hard work behind them, one thing is clear: The Russ family deserves a vacation.